With the goal of engaging and enriching local residents and organizations, Heights Arts provides arts outreach at community events, outdoor festivals, and organizes collaborative community programs such as Community Partner Appreciation Nights (2018), Make Your Mark for the Arts (2014), Here and There, Now and Then (2015), and Pet Project (ongoing). See EVENTS for currently scheduled outreach activities. Are you interested in arts outreach for an organization, school or community event? Contact executive director Rachel Bernstein at 216-371-3457 x102. 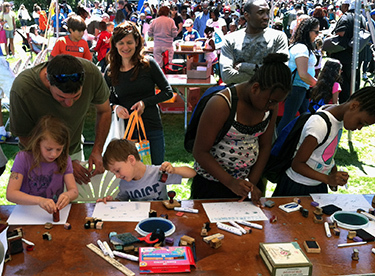 Interested in being a community arts ambassador at neighborhood festivals? We are always looking for passionate volunteers to share our love for the arts! Here at Heights Arts, partnership and community is what we are all about. We actively seek meaningful relationships with other organizations to strengthen the greater community. We are currently partnering with local animal welfare organizations through our Pet Project, and sharing membership benefits like store discounts with other organizations who share our mission to support artists. Who benefits? Everyone! We hope you agree and take advantage of the opportunities we provide. Now members from any of these organizations can enjoy a 10% discount on store purchases in any of the three stores, beginning November 3, 2017. Members can show their current membership card to receive the discount. *Sales and return policies may differ depending upon the purchase location.